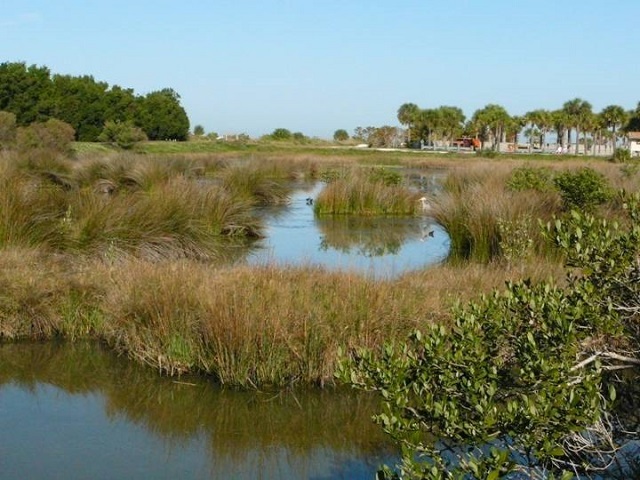 While you’re in Clearwater Beach, stop by this county park any time of year for an enjoyable birding break. The beach/dune natural community and parking areas make up the western half of the park, where you will find most of the visitors. Scan the surf in winter for Common Loon and Northern Gannet, and scope the beach for Sanderling, Semipalmated Plover, American Oystercatcher and Black Skimmer. Sandwich Tern, Royal Tern and Laughing Gull are common, and Bonaparte’s Gull, Gull-billed Tern, Red Knot, Snowy Plover and Wilson’s Plover occasionally are reported. Don’t forget to check Clearwater Pass on the northern edge of the park for dolphins, pelicans and other waterbirds. The park’s eastern half has small hammocks and scattered patches of trees, where you can see woodpeckers and songbirds all year long; migrants like American Redstart drop by in spring and fall. A nature trail loops through the trees and open areas in the park’s interior and leads to a brackish pond on the southern park boundary. Wading birds such as Yellow-crowned Night-Heron and Roseate Spoonbill frequent the pond. Beach wheelchairs are available upon request; bicycles and kayaks can be rented onsite (call ahead for details).